At the age of twenty-five, Orson Welles (1915вЂ“1985) directed, co-wrote, and starred in Citizen Kane, widely regarded as the greatest film ever made. But Welles was such a revolutionary filmmaker that he found himself at odds with the Hollywood studio system. His work was so far ahead of its time that he never regained the wide popular following he had once enjoyed as a young actor-director on the radio. What Ever Happened to Orson Welles? : A Portrait of an Independent Career challenges the conventional wisdom that Welles's career after Kane was a long decline and that he spent his final years doing little but eating and making commercials while squandering his earlier promise. In this intimate and often surprising personal portrait, Joseph McBride shows instead how Welles never stopped directing radical, adventurous films and was always breaking new artistic ground as a filmmaker. McBride is the first author to provide a comprehensive examination of the films of Welles's artistically rich yet little-known later period in the United States (1970вЂ“1985), when McBride knew and worked with him. McBride reports on Welles's daringly experimental film projects, including the legendary 1970вЂ“1976 unfinished film The Other Side of the Wind, Welles's satire of Hollywood during the "Easy Rider era"; McBride gives a unique insider perspective on Welles from the viewpoint of a young film critic playing a spoof of himself in a cast headed by John Huston and Peter Bogdanovich. To put Welles's widely misunderstood later years into context, What Ever Happened to Orson Welles? reexamines the filmmaker's entire life and career. McBride offers many fresh insights into the collapse of Welles's Hollywood career in the 1940s, his subsequent political blacklisting, and his long period of European exile. 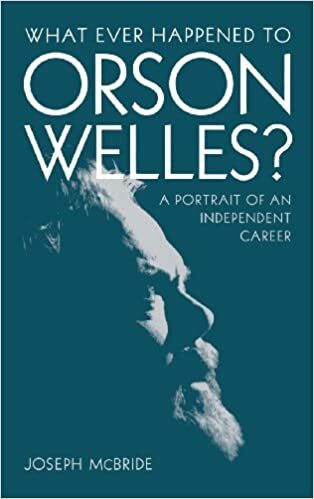 An enlightening and entertaining look at Welles's brilliant and enigmatic career as a filmmaker, What Ever Happened to Orson Welles? serves as a major reinterpretation of Welles's life and work. McBride clears away the myths that have long obscured Welles's later years and have caused him to be falsely regarded as a tragic failure. McBride's revealing portrait of this great artist will change the terms of how Orson Welles is understood as a man, an actor, a political figure, and a filmmaker.